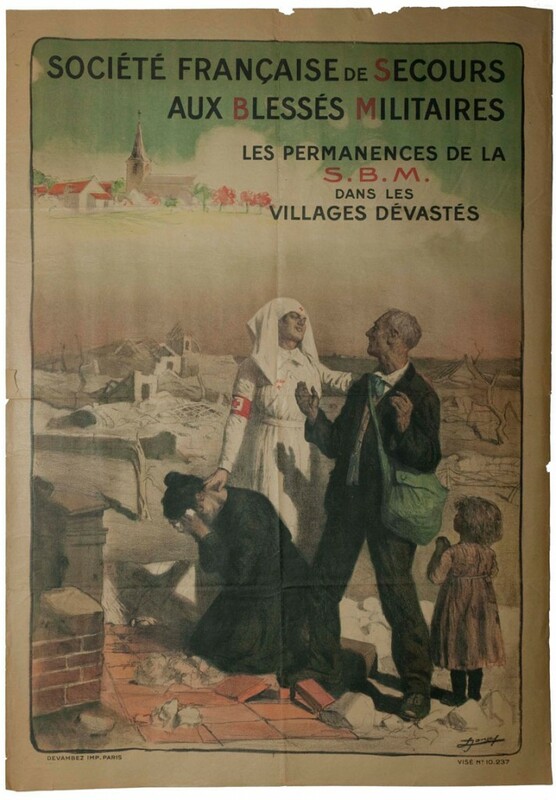 Credit: Gift of Ms. Alice C. GeorgeGiven to Wheaton College in 1971 as part of a collection of World War I posters, this work depicts a French family’s return to a village destroyed in the Great War. Devastated by the effects of this terrible conflict, the family is comforted by a Red Cross nurse. The text emblazoned across the top of this image may be translated as: “The French Society for the Assistance of Wounded Servicemen”. The S.S.B.M (Société de Secours aux Blessés Militaires), the first Red Cross society in France, was established in 1866. Continuing its efforts to help survivors of conflict, the S.S.B.M provided aid to those whose lives were disrupted by World War I. Officially a ‘military painter secunded to the Musée de l’Armée,’ Jonas created an image in which the nurse’s armband shows the shortened logo, S.B.M. She attempts to comfort a distressed elderly man and a weeping kneeling woman as a young girl looks on. Set in the rubble of a razed village, the scene depicts three generations, all affected by war. In the upper left-hand corner of the poster, above the chaos and desolation, the artist reveals a prosperous village that has been rebuilt, perhaps suggesting what can be achieved with the help of the S.B.M. This hope for the future, as well the affirming presence of the nurse, demonstrates the importance of the Red Cross during World War I.